Zhangjiakou Xuanhua Jinke Drilling Machinery Co., Ltd.
Quzhou Jugong Machinery Co., Ltd.
Quzhou Sanrock Heavy Industry Machinery Co., Ltd. It's suitable to be applied in equipment installation, water & electricity, pipe line installation, civil construction inspection, airport, highway and railway, channel construction, etc. Started since 1996, with "CAYKEN" brand top in China, to creat the most influential international drilling machinery--insisted powerful, comfortable and safe operating experience. Together with the international drilling market quickly update and develop, we are creating a competitive industry force for workers with high efficiency. 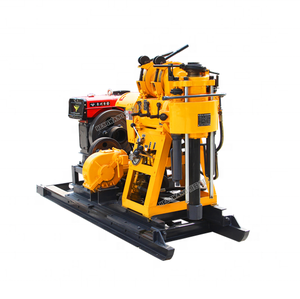 HZ-200YY borehole drilling machine Introduction: HZ-200YY borehole drilling machine is suited for the applications of general exploration and investigation, geophysical prospecting, road and construction survey, blast holes and other drilling operations. HZ-200YY type: track-mounted rig, trailer mounted rig HZ-200YY borehole drilling machine Features: rotary drilling rig 1.easy operation 2.lightweight to move 3.reasonable price 4.good service Technological Data of HZ-200YY borehole drilling machine : Unity machine parameter Drilling depth 20 0m Maximum open hole caliber 30 0mm End hole caliber 75mm Drill rod caliber 6 0mm Drilling angle 90~75 Drill weight (No include power) 975 kg Triangle conveyer belt B950 x 4 B1700 x 3 The main machine moving distance 300m Power diesel engine 22HP electric motor 15kw Spindle spindle speed 64, 128, 287, 557 r/min Spindle stroke 450mm Hoist Max. single line hoisting capacity 240 0kg Single line lifting speed 0 . 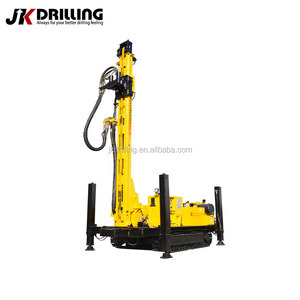 That strengthens the crawler rock drill&rsquo;s adaptability to severe environment and lengthened the diesel engine&rsquo;s service life. 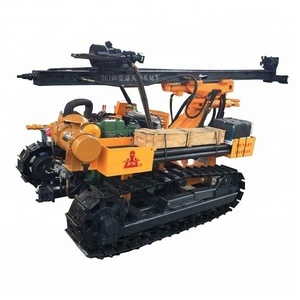 That provides the crawler rock drill, a type of wagon drill, with strong torque reserve and reduce the sticking drilling rate. Adjust the pressure regulating valve on the control valve can get the favorable driving power which is required by the working condition. drilling depth can be 230m with the opening diameter of 75-400mm, trailer, crawler, and tractor chassis for choice. a. the machine is equipped with crawler chassis device, easy to move with fast speed. b. drill mast controlled by hydraulic cylinder, improve the efficiency diesel engine adopt the electric starter, to reduce the labor intensity. Shijiazhuang Jindi Drilling Machinery Co., Ltd.
2. Designed with hydro-chucking unit instead of slips to ensure drilling from stop when changing pipes. All the drill, water pump and diesel engine installed on one base frame result in space-saving. 5. Light in weight, easy disassembling for transportation and applicable to working conditions in plain and mountain areas. 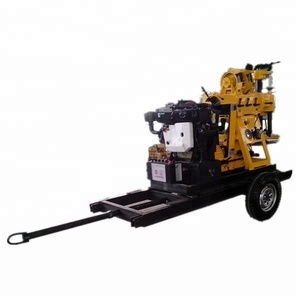 Popular model electric borehole core drilling machine price reasonable I. 2.Skilled manufacturing technique for electric borehole core drilling machine price . We are professional manufacturer and suppiler for electric borehole core drilling machine price. 2. Hydraulic control , diesel engine 3. Drill on soil, sand, gravel, thick\hard rocks, marble, and any other hard ground, etc. 4. Mainly used to drill wells for farm irrigation wells, garden irrigation wells, fresh water drinking or anywhere need fresh water. Specially recommendation Keeping bracket is installed on the hoist to form a double wheel support structure, can withstand strong blow. 2. 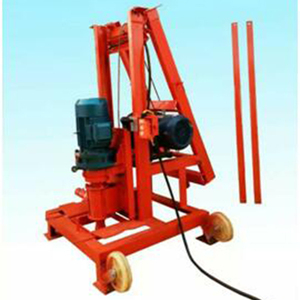 Used for shallow hydrogeological survey and the construction of shallow Wells. 4. Used for the construction of seismic blasting holes. * Engineers available to service machinery overseas.